NEW YORK (Reuters) - Investors who made early bets on Marissa Mayer's ability to turn around Yahoo Inc were well rewarded for their faith: the share price has more than doubled and widely outperformed the broader stock market since she took over as president and CEO in July 2012. But those still betting on her may have lingered too long as the stock nearly halved from November 2014 to last September. Much of the long upward trajectory was funded by an aggressive share buyback program and its stakes in Alibaba Group and Yahoo Japan. 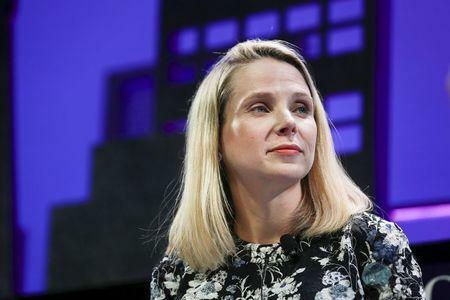 The board of Yahoo is weighing a sale of its core Internet business when it meets this week amid a broader debate about the future of the company and that of high-profile Mayer. Yahoo's stock closed at $15.64 when Mayer was appointed president and chief executive on July 16, 2012. The gains to Tuesday's close, of more than 115 percent, widely outperform gains in the S&P 500, up 55 percent since, the Nasdaq 100, up 83 percent and even Apple Inc, which has gained 35 percent in the same period. The company's market capitalization, however, has grown about 66 percent under Mayer. The difference is attributable to a decline in shares outstanding as Yahoo has bought back roughly $8.3 billion worth of its stock since the third quarter of 2012, according to Reuters data. Despite the share price doubling under her tenure, the current level, around $35 was hit in November 2013, less than a year and a half after Mayer took over. "It is clear that time is running out for the current management and they are trying to come up with an alternative. They still haven’t resolved the long-term issue of what Yahoo will be going forward,” said Skip Aylesworth, portfolio manager of the Henessy Technology fund. Aylesworth, who does not currently own shares of Yahoo, sold his fund’s stake in the company approximately a year and a half into Mayer’s tenure as chief executive after the company’s revenue and earnings metrics did not significantly improve, he said. The rally during Mayer's tenure got support from the stakes in Alibaba and Yahoo Japan. But less than half of its market cap is attributable to Yahoo's own business, according to a Thomson Reuters Breakingviews calculator. The company's stake in Yahoo Japan is held at a 30 percent discount off its actual market value, while its Alibaba stake is held at about a 59 percent discount. "This is an undervalued company if you do a sum of the parts sort of thing, it doesn’t take a whole lot of imagination to see what could be coming," said Kim Forrest, senior equity research analyst, Fort Pitt Capital Group in Pittsburgh. Yahoo plans to spin off its Alibaba stake into a public company along with Yahoo Small Business that provides domain names and local marketing. Yahoo's stock was up 6.9 percent at $36.04 in early afternoon trading on Wednesday.